Even in our hyper-connected world, Google said we struggle to communicate with the ones we love. Not that the industry lacks solutions, but there hasn’t been anything, in the company’s opinion, that moves technology aside in favor of people. It sounds a lot like Facebook’s recent philosophy with Home, and it is. 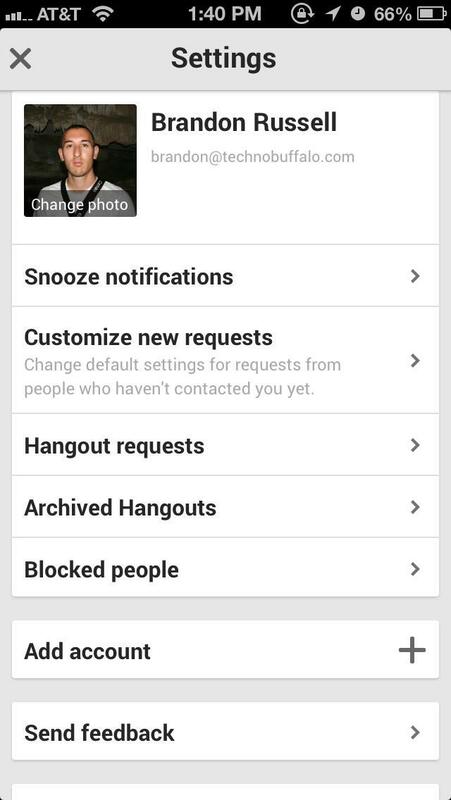 But Hangouts, Google’s new unified messaging platform, isn’t about status updates, or overtaking your home screen. The app rebuilds Google’s fragmented communication platforms into one encompassing product, and places emphasis on putting conversations first, allowing people to talk with others no matter what phone (or computer) they own. 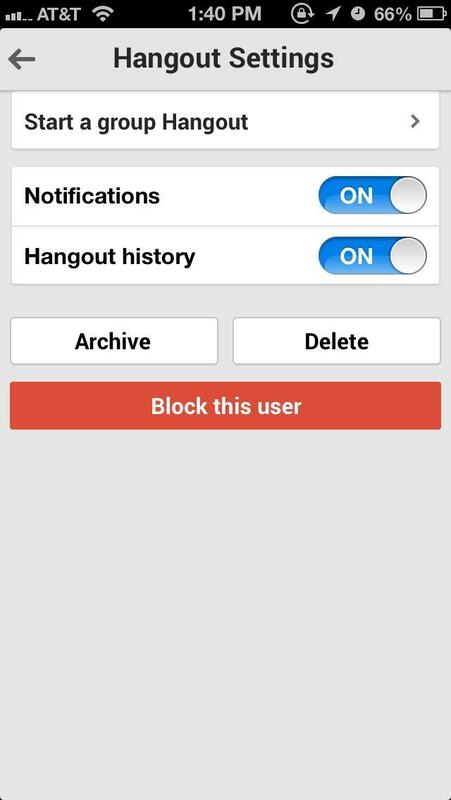 The key idea with Hangouts is seamless syncing across multiple platforms—iOS, Android, Chrome and even in Gmail. By eliminating the cumbersome experience of finding multiple solutions to stay in touch, Google has created something powered by the cloud that it (hopes) will make messaging much simpler. That’s a big ask of a company that’s jumping head first into the crowded messaging market long after competitors such as WhatsApp, Facebook Messenger and even iMessage have hit. Hangouts is a synonymous name among users in the Google+ universe, but will that mindshare translate to interest in its new unified communication app? We gave Hangouts a quick spin, and it certainly does what it promises, syncing across iOS, Android and Chrome without issue. 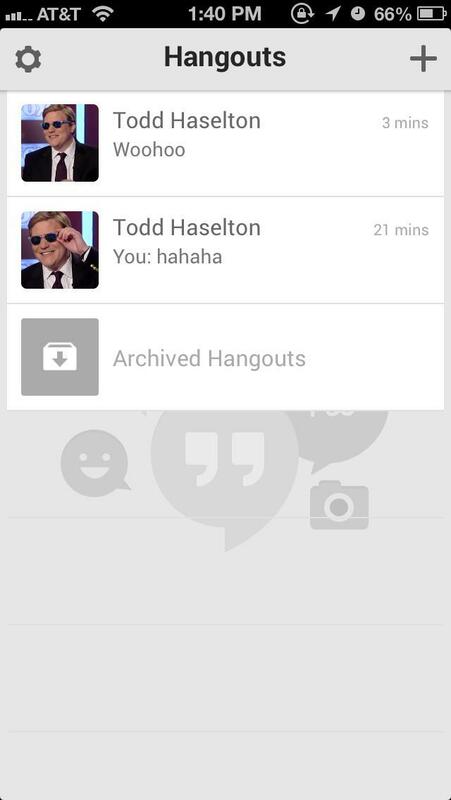 But unless you’re heavily invested in the Google+ universe, and can convince all your friends to download the app itself, Hangouts is probably something you’ll never care about. When practically the entire planet is already on Facebook, and can simply use Facebook Messenger, the benefits of relying on Google aren’t there. Not to mention that if you’re using iOS, iMessage syncs across Apple’s ecosystem no problem, allowing users to text, send pictures and FaceTime right out of the box. 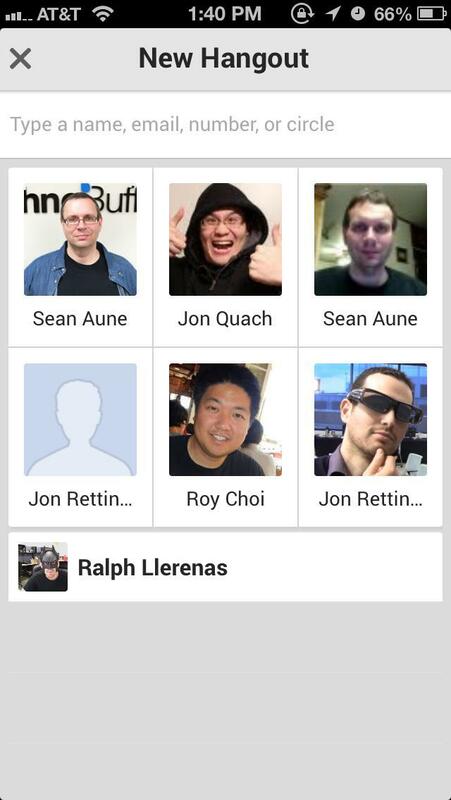 Hangouts is set up a lot like chat clients today, presenting a list of recent conversations in favor of a contact list. To start a new Hangout, simply tap on the plus icon at the top right and you’ll see a grid of users you’re connected to, where you can then click on one (or multiple) contacts to begin a chat. 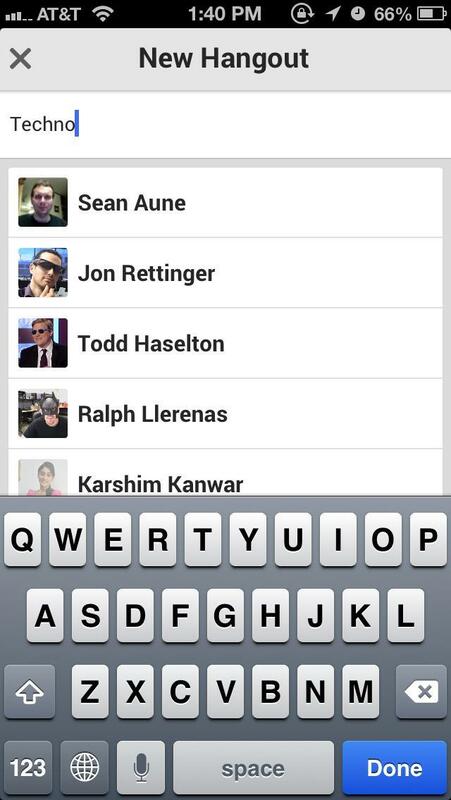 From there you can perform actions like send pictures, start a video chat and even jump right into a group Hangout. Settings include simple things like notifications, Hangout history, an option to block that user, and two buttons that allow you to archive or delete the conversation. When you’re not in a particular Hangout, you can jump into the app’s settings menu, where you can snooze notifications, customize new requests, see Hangout requests and add an additional Gmail account. Very typical control, and nothing unusual sticks out. You should have no problem setting everything up and starting conversations. Once you do start a conversation, things do become a little different, with some small flourishes. 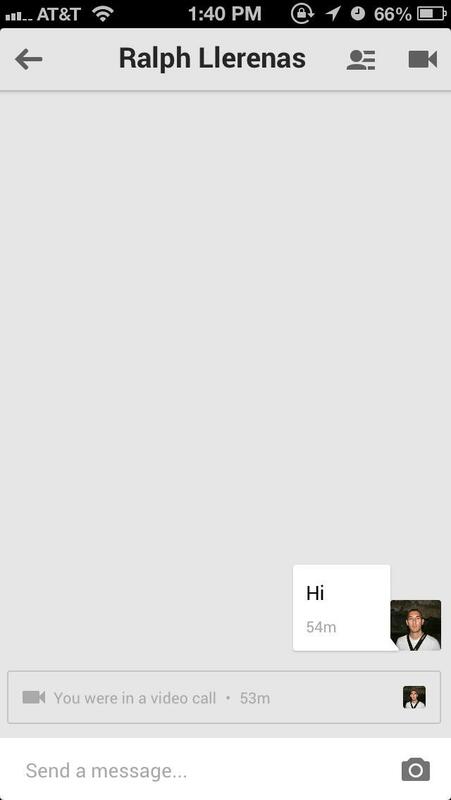 When you’re talking to someone one-on-one, or even in group chats, Hangouts introduces a little watermark feature that shows when a users is typing, or how far they’ve read into your conversation. 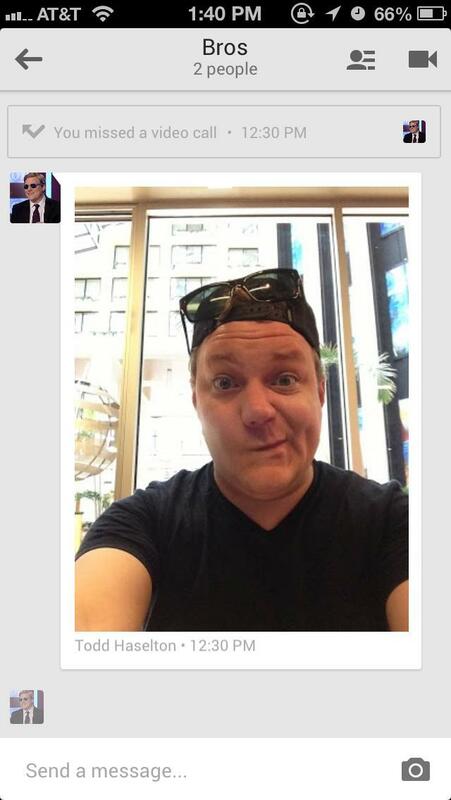 I just sent a message to Todd and he hasn’t read it yet (he’s avoiding me). Every message is tagged with a user’s name and how long ago it was sent—every single one—letting you better gauge your conversation over time. Of course, everything you’re saying and doing can be archived for reference later, which you can access right from the app’s main screen. Using Hangouts in Chrome, starting a new conversation pops out a separate window that you can drag anywhere on your desktop. From there, you can perform the more typical features—start a group, voice and video chat, set your status, and even go off the record. It’s pretty ok, and syncs just fine. I noticed that, while using OS X’s own Messages client, not everything synced up properly, but that might have to do with Apple’s own software. The messaging game is obviously a fierce market, especially with consumers sending more messages than traditional SMS. Seeing as there are already many solid solutions, whether it be Facebook, iMessage, BBM or WhatsApp, convincing users to jump over is going to be a hard sell for Google. Right now, Hangouts doesn’t have messaging features such as embedding video, voice messages, location or even SMS integration. But those might be features coming in due time. Everything is barebones at the moment, but there’s a solid foundation in place. It ultimately depends on how invested you and your friends are in a particular chat client already. If you’re already using something like WhatsApp on a daily basis, or even iMessage to keep in touch with family and friends, the benefits of switching to a newer platform aren’t really there. As the platform evolves, however, perhaps Hangouts will become a more prominent staple among users, and be the true unified solution Google was intent on creating.